When I think of latches the first thing that comes to mind is my Uncle Jake’s outhouse and how I got stuck in it as a kid. Its door was outfitted with a rusty old latch that had a nasty habit of locking up when someone entered, and it would take a tricky set of raps and bangs to loosen. One day it was being particularly unresponsive to my repeated attempts to open it, and the scene became like something out of a horror movie. There was a lot of screaming. When latches operate well, they’re indispensable. Let’s take our example circuit from last time a bit further by adding more components and wires. We’ll see how a latch can be applied to take the place of pressure exerted by an index finger. See Figure 1. Our relay now contains an additional pivoting steel armature connected by a mechanical link to the original steel armature and spring. The relay still has one N.C. contact, but it now has two N.O. contacts. When the relay is in its normal state the spring holds both armatures away from the N.O. contacts so that no electric current will flow through them. One armature touches the N.C. contact, and this is the point at which current will flow between hot and neutral sides, lighting the red bulb. The parts of the circuit diagram with electric current flowing through them are denoted by red lines. Figure 1 reveals that there are now two pushbuttons instead of one. Now let’s go to Figure 2 to see what happens when someone presses on Button 1. Again, the parts of the circuit diagram with current flowing through them are denoted by red lines. 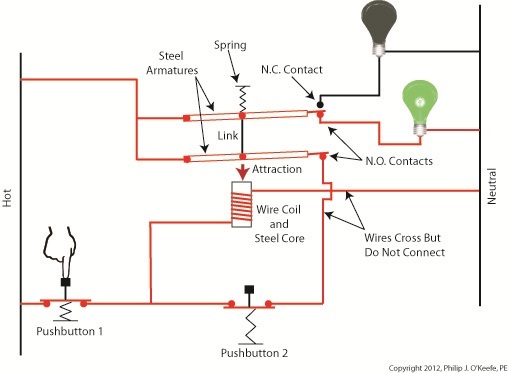 From this diagram you can see that when Button 1 is depressed, current flows through the wire coil, making it and its steel core magnetic. This electromagnet in turn attracts both steel armatures in our relay, causing them to pivot and touch their respective N.O. contacts. Electric current now flows between hot and neutral sides, lighting up the green bulb. Current no longer flows through the N.C. contact and the red bulb, making it go dark. If you look closely at Figure 2, you’ll notice that current can flow to the wire coil along two paths, either that of Button 1 or Button 2. It will also flow through both N.O. contact points, as well as the additional armature. So how is this scenario different from last week’s blog discussion? That becomes evident in Figure 3, when Button 1 is no longer depressed. In Figure 3 Button 1 is not depressed, and electric current does not flow through it. The red bulb remains dark, and the green bulb lit. How can this state exist without the human intervention of a finger depressing the button? Because although one path for current flow was broken by releasing Button 1, the other path through Button 2 remains intact, allowing current to continue to flow through the wire coil. This situation exists because Button 2’s path is “latched.” Latching results in the relay’s wire coil keeping itself energized by maintaining armature contact at the N.O. contact points, even after Button 1 is released. When in the latched state, the magnetic attraction maintained by the wire coil and steel core won’t allow the armature to release from the N.O. contacts. This keeps current flowing through the wire coil and on to the green bulb. Under these conditions the relay will remain latched. But, just like my Uncle’s outhouse door, the relay can be unlatched if you know the trick to it. Relays may be latched or unlatched, and next week we’ll see how Button 2 comes into play to create an unlatched condition in which the green bulb is dark and the red bulb lit. We’ll also see how it is all represented in a ladder diagram. My daughter will be studying for her driver’s license exam soon, and I can already hear the questions starting. “What does that sign mean? Why does this sign mean construction is ahead?” Symbols are an important part of our everyday lives, and in order to pass her test she’s going to become familiar with dozens of them that line our highways. Just as a triangle on the highway is a symbol for “caution,” industrial control systems employ a variety of symbols in their diagrams. The pictures are shorthand for words. They simplify the message, just as hieroglyphics did for our early ancestors who had not yet mastered the ability to write. Ladder diagrams and the abstract symbols used in them are unique to industrial control systems, and they result in faster, clearer interpretations of how the system operates. Last week we analyzed an electric circuit to see what happens when we put a relay to use within a basic industrial control system, as found in Figure 1. Now let’s see how it looks in an even simpler form, the three-rung ladder diagram shown in Figure 2. Our ladder diagram contains a number of symbols. The symbol on the top rung which looks like two parallel vertical lines with a diagonal line bridging the gap between them represents the N.C. contact. This symbol’s vertical lines represent an air gap in the N.C. contact, the diagonal line is the relay armature which performs the function of bridging/closing the air gap. This rung of the ladder diagram represents the contact when the relay is in its normal state. In the middle ladder rung the N.O. contact symbol looks like two parallel vertical lines separated by a gap. There is no diagonal line running through it since the relay armature doesn’t touch the N.O. contact when this particular relay is in its normal state. The wire coil and steel core of this relay are represented by a circle on the bottom ladder rung. The contact and coil symbols on all three rungs are labeled “CR1” to make it clear that they are part of the same control relay. Other symbols within Figure 2 represent the red and green bulbs we have become familiar with from our initial illustration. They are depicted as circles, R for red and G for green, with symbolic light rays around them. The pushbutton, PB1, is represented as we have discussed in previous articles on ladder diagrams. Just as road sign symbols are faster than sentences for drivers speeding down a highway to interpret, ladder diagrams are faster than customary illustrations for busy workers to interpret. Next time we’ll expand on our electric relay by introducing latching components into the control system that will allow for a greater degree of automation. When a starving monkey is faced with two buttons, one representing access to a banana, the other cocaine, which will he push? The cocaine, every time. The presence of buttons usually indicates a choice must be made, and electric relays illustrate this dynamic. Last week we looked at a basic electric relay and saw how it was used to facilitate a choice in electricity flow between two paths in a circuit. Now let’s see what happens when we put a relay to use within a basic industrial control system making use of lit bulbs. The relaxed spring positioned on the relay armature keeps it touching the N.C. contact. This allows current to flow between hot and neutral through the armature and the N.C. contact. When these conditions exist the red bulb is lit, and this is accomplished without the need for anyone to throw a switch or press a button. In this condition the other lamp will remain disengaged and unlit. Now let’s refer to Figure 2 to see what happens when someone presses the button. When the button is depressed the air gap is eliminated and the coil and wire become magnetized. They will attract the steel armature closer to them, the spring to expand, and the armature to engage with the N.O. contact. Under these conditions current will no longer flow along a path to light the red bulb because an air gap has been created between the armature and N.C. contact. The current instead flows through the N.O. contact, lighting the green bulb. It will stay lit so long as someone holds the button down. If our monkey were faced with the scenarios presented in Figures l and 2 and a banana was placed in the position of the red bulb, the cocaine in the position of the green, he might find that the regular delivery of bananas that takes place when the relay is in the N.C. contact position is enough to keep him happy. In this state he might be so full of bananas he won’t want to expend the energy to engage the button into the N.O. contact position for the delivery of cocaine. Next time we’ll revisit the subject of ladder diagrams and see how they are used to denote the paths of electric relays. It’s a dark and stormy night and you’ve come to the proverbial fork in the road. The plot is about to take a twist as you’re forced to make a decision in this either/or scenario. As we’ll see in this article, an electric relay operates in much the same manner, although choices will be made in a forced mechanical environment, not a cerebral one. When we discussed basic electric relays last week we talked about their resting in a so-called “normal state,” so designated by industrial control parlance. It’s the state in which no electric current is flowing through its wire coil, the coil being one of the major devices within a relay assembly. Using Figure 3 of my previous article as a general reference, in this normal state a relaxed spring keeps the armature touching the N.C. switch contact. While in this state, a continuous conductive path is created for electricity through to the N.C. point. It originates from the wire on the left side, which leads to the armature pivot point, travels through the armature and N.C. contact points, and finally dispenses through the wire at the right leading from the N.C. contact. Now let’s look at an alternate scenario, when current is made to flow through the coil. See Figure l, below. 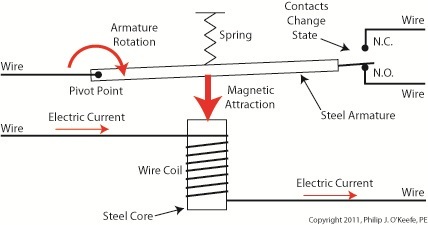 Figure 1 shows the path of electric current as it flows through the wire coil, causing the coil and the steel core to which it’s attached to become magnetized. This magnetization is strong, attracting the steel armature and pulling it towards the steel core, thus overcoming the spring’s tension and its natural tendency to rest in a tension-free state. The magnetic attraction causes the armature to rotate about the pivot point until it comes to rest against the N.O. contact, thus creating an electrical path en route to the N.O. wire, on its way to whatever device it’s meant to energize. As long as current flows through the wire coil, its electromagnetic nature will attract the armature to it and contact will be maintained with the N.O. juncture. When current is made to flow through the wire coil, an air gap is created between the armature and the N.C. contact, and this prevents the flow of electric current through the N.C. contact area. Current is forced to follow the path to the N.O. contact only, effectively cutting off any other choice or fork in the road as to electrical path that may be followed. We can see that the main task of an electric relay is to switch current between two possible paths within a circuit, thereby directing its flow to one or the other. Next time we’ll examine a simple industrial control system and see how an electric relay can be engaged with the help of a pushbutton. I’ve always considered science to be cool. Back in the 5th grade I remember fondly leafing through my science textbook, eagerly anticipating our class performing the experiments, but we never did. For some reason my teacher never took the time to demonstrate any. Undeterred, I proceeded on my own. I remember one experiment particularly well where I took a big steel nail and coiled wire around it. When I hooked a battery up to the wires, as shown in Figure 1 below, electric current flowed from the battery through the wire coil. 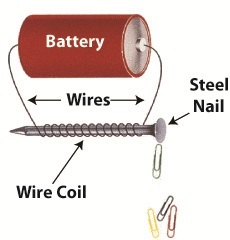 This set up a magnetic field in the steel nail, thereby creating an electromagnet. My electromagnet was strong enough to pick up paper clips, and I took great pleasure in repeatedly picking them up, then watching them unattach and fall quickly away when the wires were disconnected from the battery. Little did I know then that the electromagnet I had created was similar to an important part found within electrical relays used in many industrial control systems. 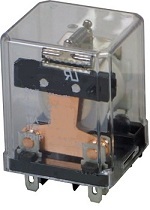 An example of one of these relays is shown in Figure 2. So, what’s in the little plastic cube? Well, a relay is basically an electric switch, similar to the ones we’ve discussed in the past few weeks, the major difference being that it is not operated directly by human hands. Rather, it’s operated by an electromagnet. 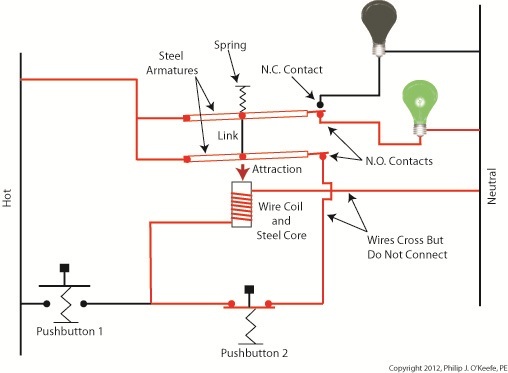 Let’s see how this works by examining a basic electrical relay, as shown in Figure 3. Next to the steel core there is a movable steel armature, a kind of lever, which is attached to a spring. On one end of the armature is a pivot point, on the other end is a set of electrical switch contacts. When the relay is in its normal state, the spring’s tension holds the armature against the “normally closed,” or N.C., contact. 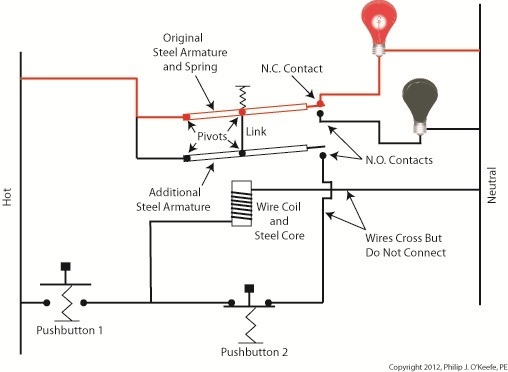 If electric current is applied to the wire leading to the pivot point on the armature while in this state, it will be caused to flow on a continuous path through the armature and the N.C. contact, then out through the wire leading from the N.C. contact. In our illustration, since the armature does not touch the N.O. contact, an air gap is created that prevents electric current from traveling through the contact from the armature. Next week we’ll see how these parts come into play within a relay when electric current flows through the coil, turning it into an electromagnet. I always enjoy watching impatient people waiting for an elevator. They press the button, and if it doesn’t come within a few seconds they press it over and over again, as if this will hurry things up. In the end they must resign themselves to the fact that the elevator will operate in its own good time. Pushbuttons, although simple in appearance like the big, red “Easy” button that’s featured in a certain business supply chain’s commercials, are actually complex behind the scenes. They perform important functions within the industrial control systems of a huge diversity of mechanized equipment. 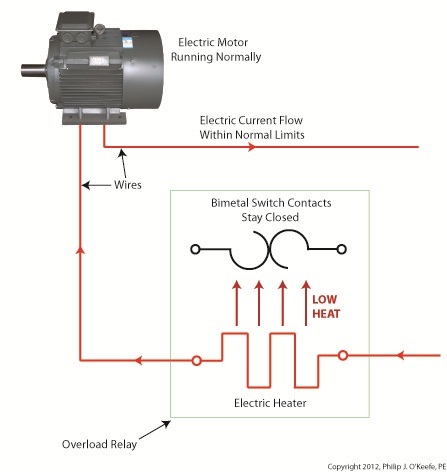 Figure 1(a) shows a pushbutton hooked up to an electric motor. When no one is pressing it a spring in the pushbutton forces the button to rest in the up position, allowing an air gap to exist in the electrical circuit between hot and neutral and preventing current from flowing. This type of switch is characterized as a “normally open” switch in industrial control terminology. Figure 1(c) shows the ladder diagram version of 1(a). “Normally closed” refers to the fact that when no one is depressing the button, the normal operating position is for the air gap to be absent, allowing electrical current to flow and the motor to operate, as shown in Figure 2(a). Figure 2(b) shows that an air gap is created when the button is depressed and the spring holding the mechanism into the normally closed position is forced down. This action interrupts electrical current and causes the motor to stop. Figure 2(c) shows the simplified line drawing version of 2(a). You can imagine how strained your finger would be if it had to press down on that button with any frequency or duration. Next time we’ll see how electrical relays work alongside pushbuttons to give index fingers a break.